So many adjectives come to my mind when I think about this cake, all of them positive, obviously. 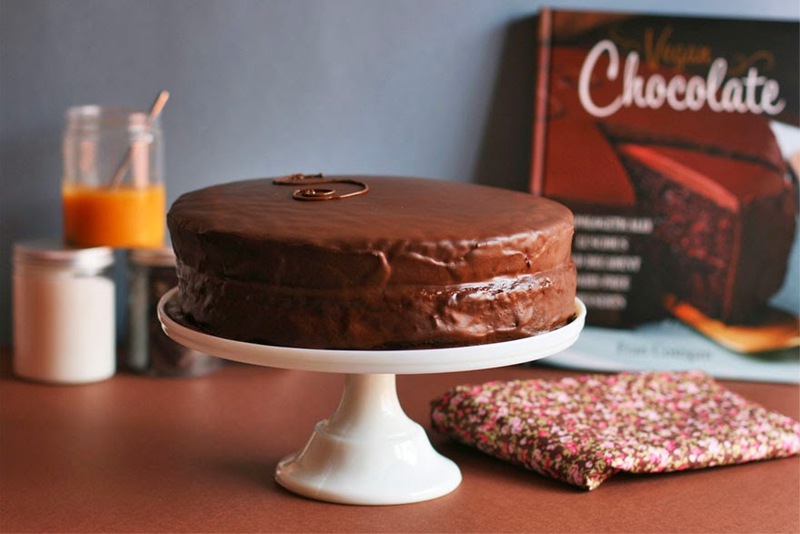 Once again Fran Costigan, the author of the cookbook 'Vegan Chocolate' (and without a doubt the queen of vegan desserts) from which I made this recipe has left me in awe. Her new book is full of perfectly explained and detailed recipes that are yummy and plain irresistible. I've made several Sacher cakes (or Sachertorte, which sounds more professional and fancy to me) over the past years and I kid you not when I say this is by far the moistest and most chocolaty cake I've ever baked/eaten. Delicious, decadent, intense...it almost made me cry of joy when I tasted the first crumbs once the cake was cooled. Don't you feel a great sense of accomplishment when you try a recipe for the first time and it turns out perfect?! Happy dance, giggles, jumps and some spoon-licking are the consequences of such success. Okay, I think you actually got an idea of my excitement and love for this cake so let's go straight to the recipe! 1/2 cup whole wheat pastry flour. 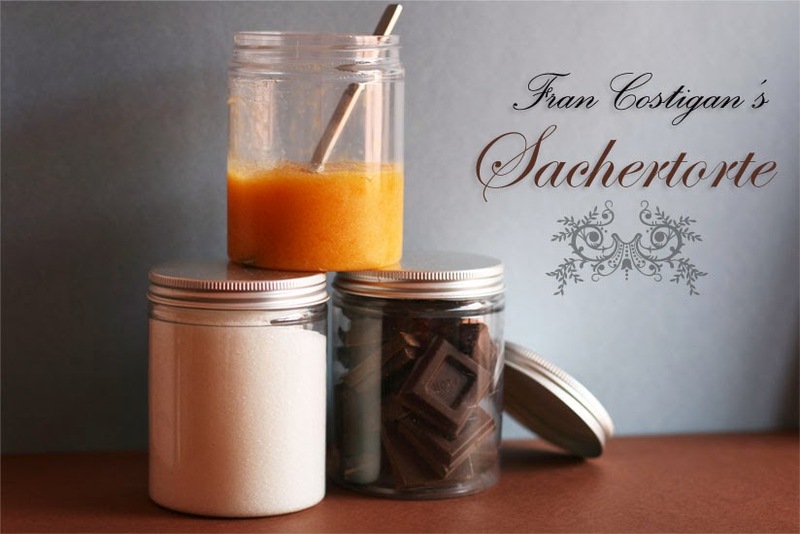 1/4 cup plus 1 tbsp cocoa powder. 1/4 cup granulated sugar, finely ground in a blender. 1/2 tsp fine sea salt. 1/4 cup mild tasting extra-virgin olive oil. 1/2 cup pure maple syrup. 3/4 cup plus 2 tbsp soy milk (or any nondairy milk). 8 ounces (227g) dark chocolate (70 to 72%), finely chopped. 1 1/4 cups soy milk (or almond milk). 1 1/4 tsp pure vanilla extract. 2 tsp mild tasting extra-virgin olive oil. I suggest to make this recipe two days ahead: make the chocolate glaze the first day and the cake, assembling and decoration the next day. Very importantly, once the cake is completely cooled keep it in the refrigerator so it will set and become more consistent. This type of cake is really soft, moist and tender, therefore quite difficult to handle. Preheat oven to 350ºF (180ºC). Grease the sides and bottom of a 9-inch (23cm) cake pan and line the bottom with parchment paper. Place a wire mesh strainer over a medium bowl. Add the pastry flour, all-purporse flour, cocoa, sugar, baking powder, baking soda and salt to the strainer and stir with a whisk to sift the ingredients into the bowl. If any small bits remain in the strainer, add them to the mixture in the bowl. Whisk to aerate the mixture. Whisk the oil, maple syrup, nondairy milk, vanilla, and vinegar in a separate medium bowl until completely combined. Add into the dry mixture and whisk until the batter is smooth. Pour the batter into pan. Rotate the pan to level the batter and tap it lightly on the counter to get rid of some of the air bubbles. Bake the cake on the center rack for 30 minutes approximately, or until the top of the cake is set, the sides have started to pull away from the pan, and a wooden toothpick inserted into the center comes out clean or just with a few moist crumbs. 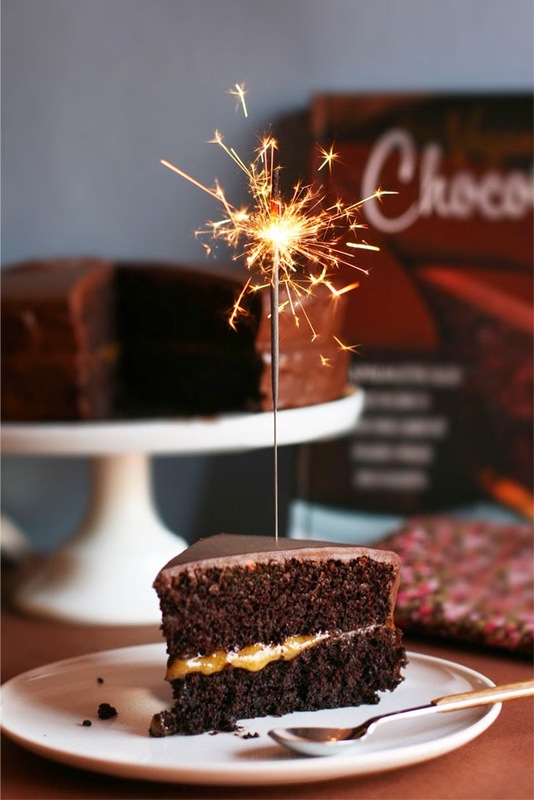 Place the cake pan on a wire rack and cool for 5 minutes. Run a thin spatula around the sides of the cake to release the sides of the cake from the pan. Invert the layer onto the rack, remove the pan, and carefully peel off the parchment paper. Invert again, top side up on the rack, to cool completely. When the cake is completely cool, slide a cardboard circle or a flat plate underneath. Don't forget to refrigerate the cake until cold before glazing! And keep it away from strong odors. Pour the milk into a small saucepan. Add the sugar and salt. Cook over medium heat, whisking a few times to a low boil. Immediately remove the saucepan from the heat. Pour the hot milk over the chopped chocolate all at once. Make sure the chocolate is completely submerged. Cover the bowl with a plate and let stand undisturbed for 4 minutes. Add the vanilla and olive oil and whisk from the center out only until smooth and glossy. If the chocolate is not completely melted you will have to follow the double boiler method. It is as simply as melting the chocolate in a water bath: set a heatproof bowl with the chocolate on a saucepan that contains a few inches of water, make sure the bottom of the bowl sits above the water. Heat the water to a low simmer and wait until the chocolate is melted. Keep the bowl of ganache at room temperature. If the glaze is too firm, add 1 tablespoon of room temperature milk. 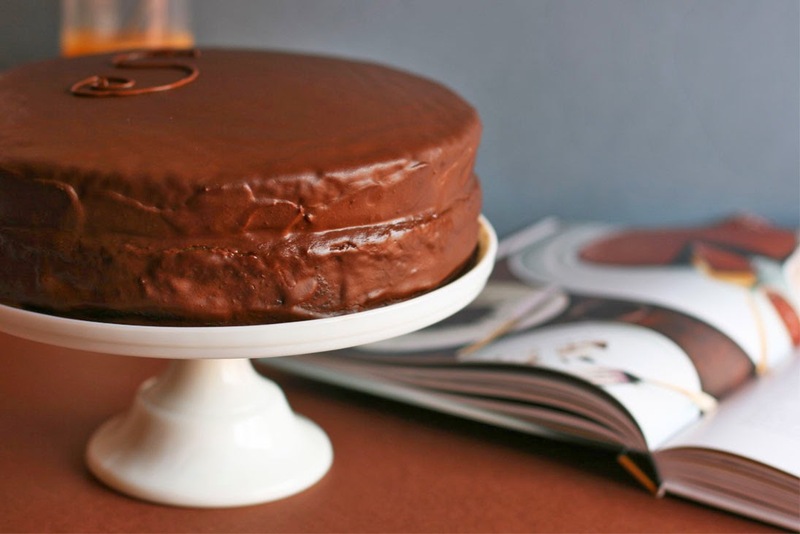 Allow the ganache to thicken at room temperature for 15 to 25 minutes. Stir a few times before glazing. 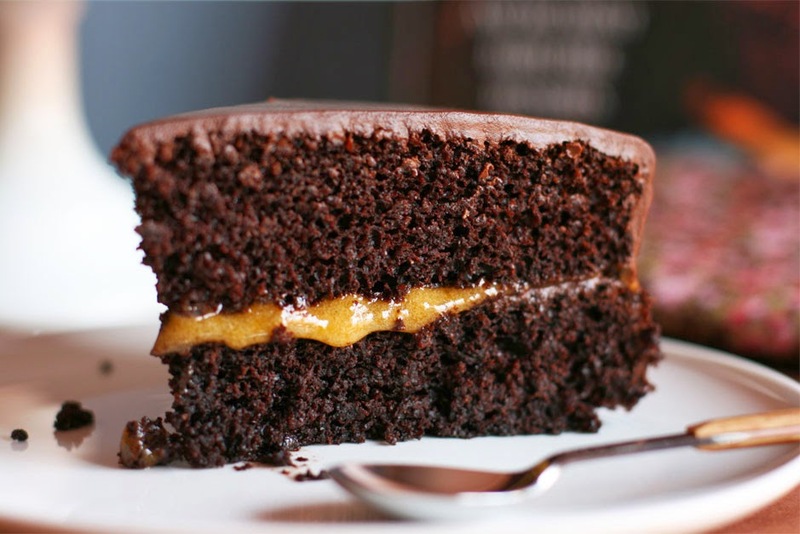 Place the first cake layer on a cardboard cake circle that is exactly the same size or slightly smaller than the cake. Spread about 1/4 cup of chocolate ganache on the layer. Allow the glaze to set in the refrigerator around 5 minutes. Spread 1/2 cup of apricot jam (the recipe calls for 1/3 cup but I always like to add a bit more) over the glaze. 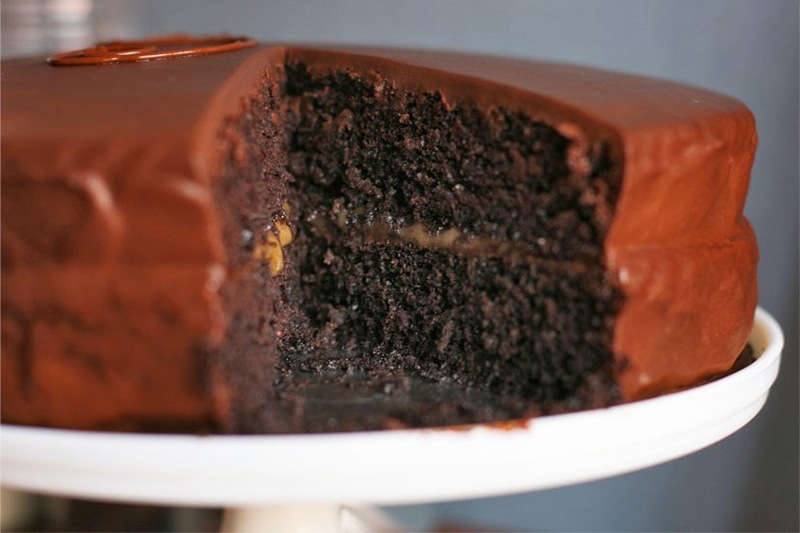 Spread the second layer of cake with 1/4 cup of the ganache glaze and refrigerate until set. Place the second layer, glaze side down, on the apricot-coated layer. Glaze the entire cake: place the cake on a wire rack set over a parchment-lined baking sheet. 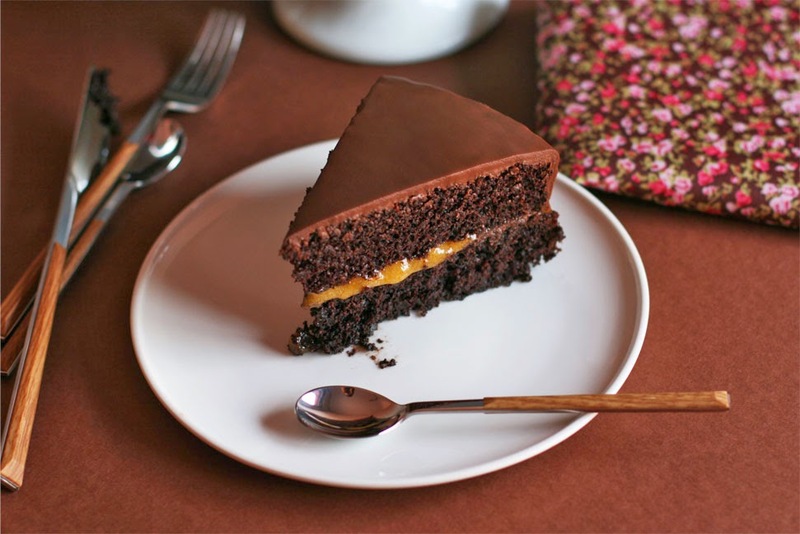 Pour 1 cup of the bittersweet chocolate ganache onto the cake, holding the cup at about the center of the cake. Using an offset spatula, coax the glaze to the edges of the cake. Allow the glaze to set undisturbed for 15 minutes, and then refrigerate the cake for 10 minutes. Refill the measuring cup with the remaining 1/2 cup of glaze and add another coating on the top of the cake. Refrigerate to set the glaze. 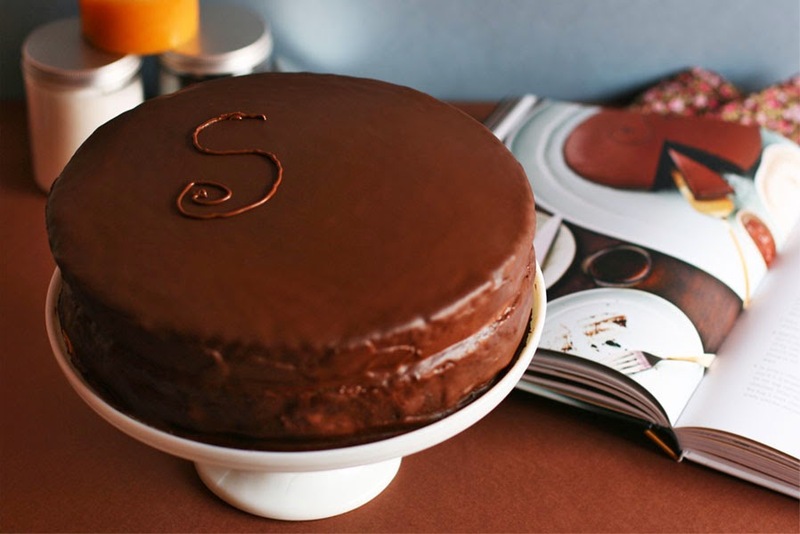 Write "Sacher" or an 'S' on top of the cake with chocolate. For the neatest slices, cut the cake while it is cold but serve at room temperature. Many thanks Elena! :-) Kisses and hugs! Espectacular Gemma, quina pinta que fa! A mi em passaria igual, si intentes una recepta per primer cop, i la claves, com no alegrar-se! I si, Sachertorte queda com més professional, jajaja!! Te ha quedado perfecta y ese relleno es estupendo!! Muchísimas gracias! :-) La verdad es que el color de la mermelada de albaricoque resalta mucho con el tono intenso y oscuro del chocolate. No se si te gustará más, pero seguro que te chifla! es muy tierna y sabrosa. Also thanks a lot for pointing out my mistake! I guess I converted the inches to centimeters the wrong way. Sorry! I would recommend you to bake this cake in a 20 cm cake pan. Anyway, I will check the original recipe tomorrow and let you know what the author suggests. I made this yesterday for my dad's Birthday and got to have it today! Best cake I've made to date, thank you so much!